Tonight I got around to finally making ornaments. They can stay on the tree for about 24 hours. Nice planning. But I am so happy with them that it could be 24 minutes and I would still be happy. I bookmarked this tutorial in October from Sycamore Stirrings. 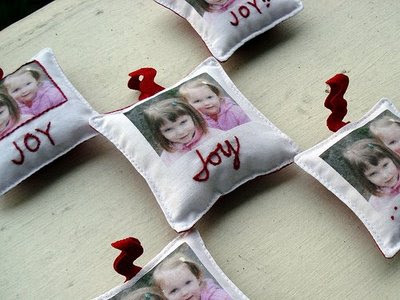 I had grand plans to make dozens of these little cuties for all of the relatives. I finally got around to taking pictures a few days ago. I didn't have any printable fabric. I didn't have time to hand embroider each one. What I did have was one sheet of dark t-shirt iron on transfer paper. I pulled the pictures into Picnik to write their names and the year, printed them out on the iron on transfer paper and sewed away. If only I knew how much I would love making these. I could literally make dozens and dozens. There is always next year. These are DARLING! I love the dingle bells and the printed fabric. Way to go! I've never used iron transfer sheets before. Is there sewing involved? Great ornaments - glad you enjoyed making them! You really wouldn't have to wait for Christmas to make these - they would be great doorknob hangers or on dresser or closet knobs. You could use pictures or just words. I'm going to make some of my grandkids and hang them around! Those are adorable! Somehow I missed this post but I am totally going to make 1 or 8 of these next year! Thanks for the idea!